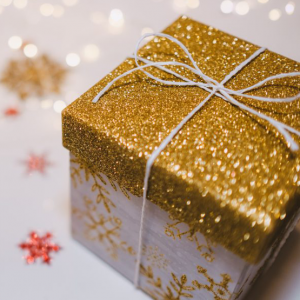 Add a gift box to any order and we will hand pick and pack your purchases into it. 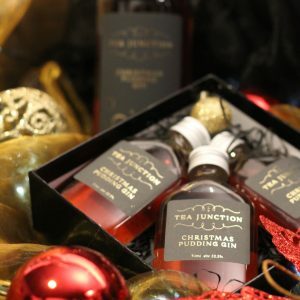 For local pick up only at the Tea Junction in Douglas, packed gift boxes cannot be posted. You must set to "local pickup" at the checkout. For local pick up only. Order now and we will let you know when you can pick up your gift set. A trio of 50ml home infused gins are included in this gift box, ideal as a Christmas stocking filler or Birthday present. Choose your Gin options below. For local pick up only. Order now and we will let you know when you can pick up your gift set. 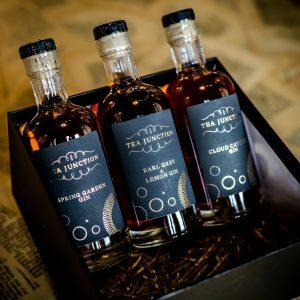 Treat a gin lover to three 250ml bottles of our wonderful home infused gins, perfectly packaged and ready to go. For local pick up only. Order now and we will let you know when you can pick up your gift set. 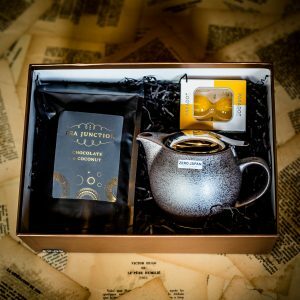 A beautifully presented gift box containing a hand-made borosilicate glass tea pot, perfect for brewing green and fruit teas, a glass tea bowl, a pack of tea from the choice below and two of our 50ml home infused gins. 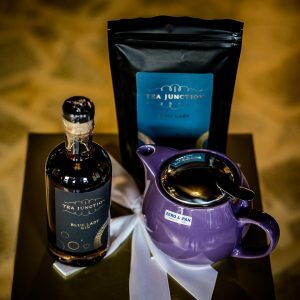 Perfect for the tea and gin lover in your life. Choose your combination of Tea and Gin below. For local pick up only. Perfect as a gift or a decadent little treat for yourself. 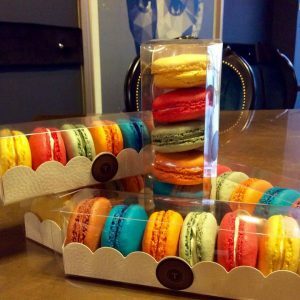 Our Macarons are made on the premises and come in an array of flavours which are constantly changing. For local pick up only. Order now and we will let you know when you can pick up your gift set. Everything you need to brew the perfect cup of tea! A hand-made Zero Japan teapot along with a pack of loose leaf tea and a Paradox tea timer to time your brew to perfection! Choose your Tea, Teapot color and Timer below. For local pick up only. Order now and we will let you know when you can pick up your gift set. 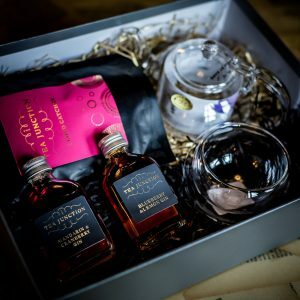 A beautiful tea and gin gift box containing a hand-made Zero Japan teapot along with a pack of your favourite tea and a 250ml bottle of our home infused gin Choose your Gin, Teapot colour and Tea below.